Our Street Signs are MUTCD / DOT compliant and made with the highest quality .080 aluminum, coated with the industries best 3M or Avery reflective sheeting and printed to last beyond the sheeting warranty. Best quality every time. 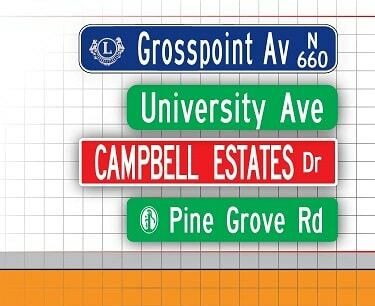 We Supply Street Signs Nationwide. Call Us today! What Size and Colors Allowed for Street Name Signs? High-performance street signs contribute to a safer community. potential crashes and improve traffic flow. Since the adoption of the 2009 National MUTCD, the lettering sizes and allowable colors for street name and some guide signs have changed. Lettering needs to be a mix of upper and lower-case letters. First letter of each name or abbreviation shall be upper-case and the rest of the lettering in the name or abbreviation shall be lower-case. Lettering height should be at least six inches (6”). For local roads with speed limits of 30 mph or less, the lettering height may be reduced to four (4”) inches. 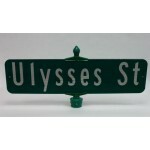 Street name signs have a white legend on a green background. Other acceptable color combinations are a white legend on a blue or brown background, or a black legend on a white background.